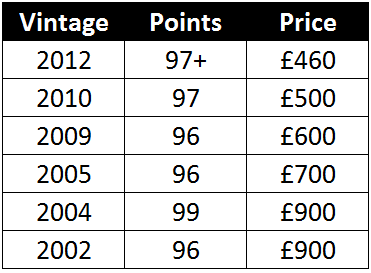 When one considers the price, £38 in bond or £48 duty and VAT paid, it becomes strikingly undervalued against its rival Penfolds Grange which costs over £300 a bottle. Amon Ra is clearly undervalued against its evident quality, yet the Glaetzers continue to offer an incentive to buy wine on release. Amon Ra has a palpable vintage premium and rises in value quickly once in bottle and since 2008 the average bottle price of the last ten vintages has risen 55%. Very deep purple-black in color, the 2012 Amon Ra reveals intense notes of blackcurrant cordial, blackberry compote and licorice with nuances of cloves, allspice, chocolate box and salami as well as a whiff of espresso. The 100% Shiraz palate offers a beast of a wine that is densely packed with black fruit and baking spice flavors and is supported with firm, grainy tannins and crisp acid through to a finish with excellent persistence. Drink it 2015 to 2025+. The deep garnet-purple colored and100% Shiraz 2012 Bishop presents a nose of warm blackcurrants, black plums and wild blueberries with touches of licorice, tar and game. Its full-bodied frame has plenty of juicy black berry flavors held in place by medium levels of grainy tannins, crisp acid and a finish with good persistence. Drink it now to 2020.